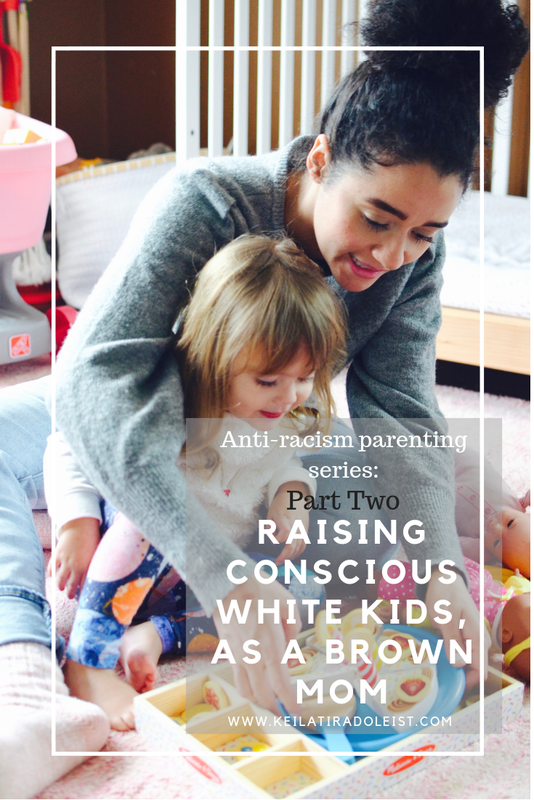 I am writing this piece as a follow-up to my first post, which you can find here, of my parenting series: "Raising Conscious White Kids, as a Brown Mom". I am writing this series to center my experience as a Brown mother and as part of my own process of decolonizing and de-centering the White narrative. I want to be clear that the safety and dignity of Black, Indigenous and people of color (BIPOC) is my priority. It is our birthright to live freely in our bodies of color in a world in which both systems and individuals enforce that it is not. If you are a BIPOC, I ask that you please prioritize your well-being as you continue reading. If you are a BIPOC raising White-presenting children, a White-presenting BIPOC, or White person raising White children, I want you to know that my words might stir up feelings of discomfort and even shame. I want you to also know, however, that I have prayed over these words in order for you to sit with your discomfort and have the courage to move forward. I am going to dive into some really deep waters. Do not panic. Allow yourself to trust that you can arrive safely to shore. There is deep internal work that must be done in order for you to awaken your sleeping consciousness to the realities of raising White kids in our society. It is necessary that you do not remain stuck within your feelings because that will not do you, your children or our world any good. I am sharing this not as a way to coddle you but rather because this is both difficult and necessary work that you must undertake. Before you react within your mind or even out loud, I need you to also believe my experience as a Brown woman and mother. After releasing my first post this past week, I received messages and comments from hundreds of folks who felt that they related to and/or needed this series in their lives. It will take me some time to respond to everyone's questions, but I wanted to be sure to write thank you for sharing space with me; I appreciate you. For those of you who have amplified my work in one way or another, I am grateful for you taking the time to do so. It is both an important and necessary way to support Black and Brown women doing anti-racism work. I am writing today with a series of responses to comments and questions that came up throughout the week. It is impossible for me to cover every angle in one blog series. However, I will try my best to address some of the bigger things as time goes on. I want to be clear that when I write "White children", I am speaking only to the socially racialized aspect of their identities; this does not necessarily speak to their cultural and ethnic Puerto Rican heritage that they share because of me. It is very important for me to be clear on this, because my children are not racialized as children of color, they are racialized as White. The color of their skin and hair is not associated with oppression like mine. Rather, they embody privileges that are associated with whiteness in almost every space they are in. I want to expand this section to further nuance how my experience as a Brown mother raising biological White-presenting children is unique--and different from--White mothers raising biological White children, which is what some of the confusion stemmed from. 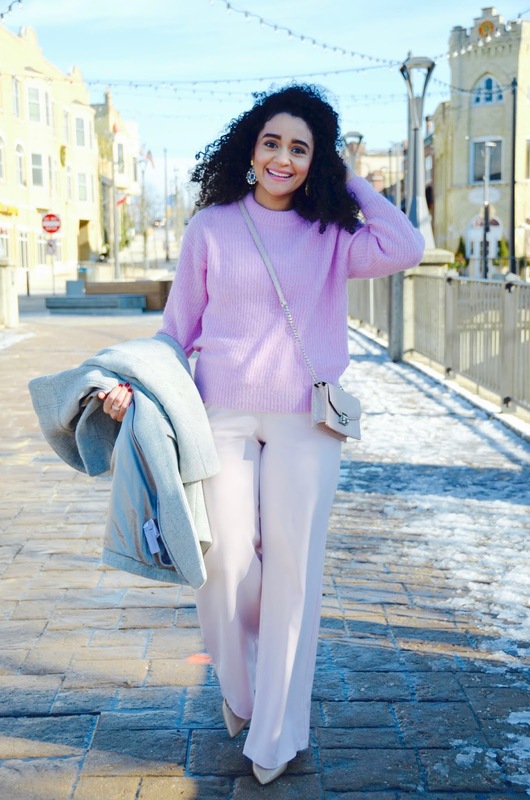 In my first piece, I discussed that my experience as a Brown woman allows me to unblock certain roads that lead to marginalization, and that is why it's so important to include and listen to the experiences of BIPOC in all areas. However, it is also unique, because not all of my children share my phenotype, which encompasses visible characteristics and features like hair texture and skin tone; yet, they still share my DNA. I believe that my children and children who are bi-racial but do not share in the phenotype-presentation of either their BIPOC parent or White parent conceptually exist in a liminal space. More specifically, a liminal space is a threshold in between 'what was' and 'the next.' (1) Liminal spaces are spaces in which we have the most potential to grow. It is in these spaces that we are undergoing the most intense transformation in order to evolve into the next phase. I tread very carefully in these waters, because I am in no way diminishing the very real oppression that I and other BIPOC face in our embodied experience. Nor do I want to super-humanize our children. Nevertheless, they exist in a liminal space which is unique to their embodied experience. In this liminal space, we as a society also have the opportunity to expand our understanding of race as a social construct and also see our children for what they are. They are children who present as White, Black or Brown. In addition, they share the heritage and bloodline of both their birth parents. As someone who has African, Indigenous and European-Spanish heritage, I too exist in a similar but distinct liminal space. It is different from my children because I do present in the same way as my parents, more specifically, my father who is Black Puerto Rican. However, my unpacking experience has been difficult, as I shared in my first post, because of the extensive colonization of Puerto Rico. So much of our history was designed and framed to erase much of our African lineage that was a result of the trans-Atlantic slave trade. Enslaved Africans were brought to the Island to mine gold after many of our Indigenous ancestors were killed due to enslavement, pillaging & infections brought by the colonizers. As a result, our language reflects the effects of erasure of our African heritage and even the exaltation of our Taíno heritage over and above our African heritage for those of us who have an African phenotype. Although I have an African phenotype, I am also light-skinned. My proximity to whiteness does provide me with more privilege and safety in different spaces. I grew up in the Midwest in an area without many BIPOC. One time, while visiting my sister who lived in a small Wisconsin town of about 1500 folks, I walked to the local library, which was inside a redesigned and quaint old home. I was standing inside, when a dark-skinned Black person walked in. They saw me and said while laughing happily, "WOW, another Black person!" Apparently, their partner had told them that, although the town was small, there were Black people who lived there, and I was one of them according to that person. I was somewhat shocked, because at that time, I had never been addressed as Black to my face in the U.S. I was very young and conceptually knew about my African heritage. Yet, I would have never considered myself to be Black. The experience had a great impact on me because it opened my awareness to how I am racialized. I have since come to embrace all that I am. It has taken years to de-colonize my language, uncover my family history and exist in a way to honor my ancestors and heal their wounds through my actions in uncovering truth. In this way, I can relate to navigating this space of uncertainty with my children because of my own process of racialization. We exist in a world where colonizers, who were White European people, created the categories of race. (They also created the gender binary, too, but that is beyond our conversation today.) Further, as I wrote before, the lightness of my skin color is a result of generations of colonization in Puerto Rico, where my ancestors were often told that marrying a White-presenting or lighter-skinned person would "mejorar la raza/better the race." The phenotype of my children, however, was not born out of any unresolved internalized colonization; rather, my union with my partner and subsequent birth of our children, was born out of love. The fact that they were born White-presenting was the result of random DNA sequencing. Therefore, my White-presenting children embody a reality in which they share my culture and heredity but not my skin-color, African features or hair texture. Their world can be confusing because society enforces oppression or liberation based on a quick glance of phenotype. In the case of my White-presenting children, they experience privileges based on whiteness in almost every space they are in. They will not have to worry about being profiled by the media or police because they are White. I don't have any issue finding stories that center characters who are White kids or find toys that look like them. They won't have to worry about having their experience questioned, like I have had for years. They can exist without anyone asking, "But where are you really from?" or make some not-so-subtle reference to being "an illegal" in this country. In many instances, folks will just assume they have wealth, which has been the opposite of my experience. However, even though they may not experience these microaggressions first-hand--because they don't embody Blackness or Browness-- they may still experience microaggressions second-hand, based on being raised within my culture, language and my being their mother. They may be in a space where no one knows they are White-presenting and may hear or witness a microagression and feel the pain that goes along with it. This is where my work as a Brown mother plays a big role, because I must prepare them to be equipped to handle these circumstances, remain grounded in the truth of their lineage and speak up against them. Their whiteness, in many ways, provides them with an advantage to be heard and taken more seriously as a result of how whiteness is celebrated and respected in our society. Of course, if you are a White person, you should be using your Whiteness to help protect BIPOC, too. (My husband would make a reference here to what was popularized by Spider-man, "With great power comes great responsibility.") As a Brown mother raising White-presenting children, I must help them navigate through this liminal space. Whiteness is not only about skin color. It is also about a culture that some White folks want to preserve for continuous power and to maintain the status quo. Whiteness as a culture can be seen in the White Nationalist movements, subsequent efforts to block invisible borders, enforce the English language and remove non-White people from the narrative. However, whiteness as a culture is also rather subtle. It exists in cities like Wauwatosa, Wisconsin, where we live. I mentioned in my first piece, that this city is highly racially segregated with majority White folks who live here at almost 90%. Most folks are left-leaning, and would likely be against this current administration, yet, would probably put up a small fight if you told them 63rd Street is more on the "Milwaukee side". White culture is a level of expectation that, in a city of mostly White people, having a few Black or Brown families is enough "diversity". Whiteness as a culture is being surprised when BIPOC shop at Whole Foods. Whiteness as a culture is second-guessing the expertise of a Brown woman, like me, to write about race. Whiteness as a culture is feeling shock that a Brown woman can have White-presenting kids, too. If you understand White culture in this way, then you will realize that it is all around us, and it is what often leads to racial violence in small and big ways. Therefore, for my White-presenting kids, their racialized experience is further enforced by the wider- White culture. One theme that came up several times throughout the week was understanding how space and healing work together. I believe that this plays into how we must continue to de-center our experience when we are doing anti-racism work. The reason I include myself in this sentence as a Brown woman is because I must also be aware of this dynamic. As a lighter-skinned Black person, I need to understand when a darker-skinned Black person needs space to heal. That is one of the painful legacies of colonization: Even intra-communally, we must be cognizant of how our proximity to whiteness and power can make us the oppressor, too. When BIPOC are healing racial trauma, we do not owe White folks access into our spaces or explanations into how we decide to heal. Our healing is a sacred experience that must be done on our own terms and in whatever way that looks. Whiteness can be hurtful to our healing because we experience its effects at every level. What does that look like, however, when we are BIPOC raising White-presenting children who also share in our lineage? To put it simply, it means that as parents our responsibility is to always ensure that we save space for our children to navigate and unpack their experience. This is deep internal work, that often happens alongside our own awakening. I am hopeful, however, because in raising our children aware of all of the varying aspects of their identity, we are living out our calling and purpose to leave a better world for them and future generations. Loved this article! But I’m left wondering what if your children weren’t considered “white”. To me, your boys look Hispanic or of Spanish decent. Your daughter has blonde hair but she could also look of Spanish decent. I’m not saying there is anything wrong with that but there are soo many mixed children now, not one looks more like the other race or other. It’s like they’re in between. I’m not sure my comment makes sense but from someone who has a mixed niece (my niece is half latina and half white) to a lot of people she may look more white or more Latina but in reality she looks like a mixture of both it’s like there’s a inbetween. Hello and thank you! When I first read your comment, I thought that you had left it on the first post in the series, because I was going to suggest to read this second post which goes into more detail. I think I understand where you are getting at and that's why I explained more about phenotype. I think race is subjective and dependent on the spaces we're in too, which is why I shared some of my personal experience with racialization. I'm also not clear on what you mean when you write "Hispanic." Hispanic is a term used by the U.S. government to describe people from all Latinx countries. In Latinx countries, like Spain, there are White-presenting, Black, Brown and folks with all different skin tones and hair types. I also disagree that children who are mixed-race look look like both parents, that is a very subjective opinion. To you my daughter might look "Latina" but perhaps that is because you see her next to me. It is not only that she has blonde hair, but she presents as White. I'm also reading your comment as silencing to my own experience raising children who in many spaces I am questioned about whether or not they're my children. Wow I’m actually sorry to hear ppl have said that to you. I believe your children look like you and your husband especially your youngest boy. It’s really sad that this happened. I picked the wrong word to use (Hispanic) and i apologize for that. I also thank you for opening my eyes more on this matter. To be honest, I really didnt mean to offend you and if I did I am sorry. But I do thank you for clarifying things for me as well. I harbor no ill feelings towards you and I appreciate your apology! I also think that C looks a lot like me, he is also more of my skin tone too. They are all truly a reflection of the both of us! These conversations are really difficult, and I feel that it is my calling to make space for them and to share my truth.